Today the Navajo live on the largest reservation in the United States. The number of tribal members ranks second only to the Cherokee. Unlike most tribes, the Navajo have kept their language alive. Over 97% of adult Navajo speak the Navajo language. Although much of the land on the Navajo Reservation is arid, historically there have been substantial water resources. For the last hundred years the land has been used for grazing. Lately, overgrazing and misuse of underground water by power and coal companies have diminished the land and water resources. 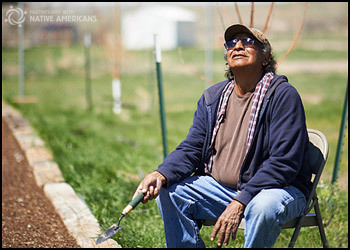 The Navajo reservation boasts half a million acres of forest. Oil, gas, coal and uranium are found underground. The Navajo people believe they are safe within the four sacred mountains that bound their reservation — Mt. Taylor, San Francisco Peak, Blanca Peak, and the La Plata Range. In their creation stories this is the place of their origins; of their emergence to the surface of the earth from the other worlds below. The Navajo call themselves “Diné” — The People. About 8,000 lived in the Southwest in 1680. They came from the North, but were influenced by the Anasazi culture, already in place in the Southwest. The Navajo language comes from the Athapascan linguistic family, which originates in Northern Canada and Alaska. The Navajo were nomadic people in constant search of food for survival. The Navajo overran the Pueblo People in New Mexico and learned farming, weaving, and various crafts from them. Banditry was the cornerstone of the Navajo economy for many decades. The Navajo were considered to have a keen intellect, and adapted themselves by using the tools provided by other cultures. They stole not only ideas, but the craftsmen and artisans of other tribes to teach new technology to their people. The Navajo were willing to both dominate and accept other cultures and people. This allowed them to become the largest and most pervasive tribe in the Southwest. They took the best of everything and incorporated it into how they developed their society and how they learned to survive. The Navajo became accomplished horsemen after the Spanish came. They also took sheep and goats from the Spanish and became herders. The Spanish used the Navajo for slave labor and tried to convert them to Catholicism. This led to continual skirmishes between the Spanish and the Navajo. The Navajo generally lived in widely scattered buildings called hogans, instead of in pueblo-like communities. After the U.S. acquired Arizona and New Mexico in 1848, the U.S. tried to wipe out the Navajo.